The Top 10 Buildings in the World Over Time #infographic ~ Visualistan '+g+"
Since the dawn of time, the human race has competed to have the greatest feats of civilization. In the ancient world, these were the storied wonders of the world which included such architectural accomplishments as the Great Pyramid of Giza and the Roman Colosseum. Around the turn of the 20th century, architects in New York City began to look to the sky. Year after year, taller and taller buildings, now called skyscrapers, were built. As soon as a building was crowned the tallest in the world, another one was being completed that snatched the title away; these skyscrapers became the stuff of legend. Everyone's heard of the Empire State Building, the Chrysler Building, the Sears Tower, or the World Trade Center, but the race to the sky has since become a worldwide competition. Today, buildings like the Petronas Towers, Taipei 101, the Burj Khalifa, and the Jeddah Tower have left the world in wonderment and have far surpassed the height of the buildings of old. 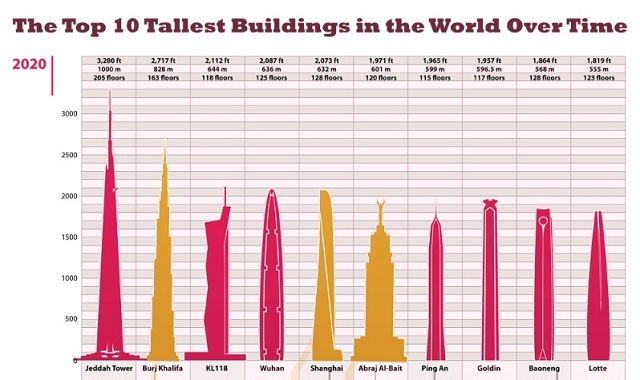 This infographic examines the world's top 10 tallest buildings in the years 1940, 1960, 1980, 2000, 2016 and looks to the future in 2020. Who will win this battle of the ages?